UTAR Faculty of Business and Finance’s Final Year Financial Economics student Jackie Chan Sheng won Second place in the Kejohanan Catur Tertutup Negeri Perak 2016 held from 3 to 4 December 2016 at the Perpustakaan Awam Negeri Perak. 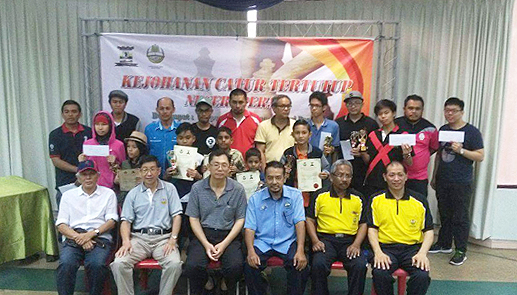 Co-organised by the Perak Chess Association and Perpustakaan Awam Negeri Perak, the competition was only open to Perak citizens, and with the purpose to enable local chess players to showcase their skills and talents. Chan proved his mettle at the chess battlefield against 101 participants, which led to him walking home with a trophy and a RM400 cash prize. Despite being rewarded for his talent and skill, the chess enthusiast mentioned that losing was just as important to him as it has taught him over the years to be more cautious and to be prepared when facing younger opponents. “Mastering chess is not easy, but through my many years’ experience and practice, I was able to be crowned the first runner up. The ability to be farsighted, focused and able to solve complex situations in a short time will allow each player to come out ahead of their opponent,” enthused Chan. For Chan, the game was not just a mere hobby, but instead “chess is life”; it is a game of art and science that includes how to predict your opponents and to strategise against them. More importantly, juggling between his hobby and studies, Chan mentioned that he was grateful to UTAR for teaching him the importance of time management and the need to strike a balance between studies and leisure activities, to balance his mental and physical health in his scholarly years.